Roland James Russell was born on the family homestead on June 23, 1935 in Nipawin, Saskatchewan. From his earliest years he was a businessman, an entrepreneur and a leader. A role model in every sense of the word, Rollie was always walking the walk and setting the pace, leading by personal example and with his energy, charisma, integrity and fairness. Roland is survived by his beloved daughters, Carollyne Coulson (Lewkas) and Corae Russell (Scott); loving wife Sharlene; cherished grandchildren Micaela and Spencer Russell, Connors and Seann Coulson; first wife Corill, Sister Rae Joseph; nephew Randy Joseph, and niece Dahrlyne Knaus. Roland made his mark early. By age 27 he was General Manager of the largest equipment dealership in Western Canada at the time, Pioneer Machinery. His life as an entrepreneur started in 1970 when he purchased equipment himself and entered the construction industry where he learned firsthand the challenges of contractors in the field. By 1974 he had developed ideas for improving the equipment used in gravel processing and contracted a local fabrication shop to build some equipment to his design specifications. The equipment attracted the attention of friends, and he couldn’t say no when they wanted to buy them. Roland sensed an appetite in the marketplace for his pioneering designs and left construction in 1975 to found his third and last company, ELRUS Aggregate Systems, specializing in the design and manufacture of portable aggregate processing equipment. His ideas, unique to the industry at the time, have become industry standard. Celebrating 35 years in 2010, the ELRUS family has over 150 proud members across Canada and the company is renowned for quality and value. 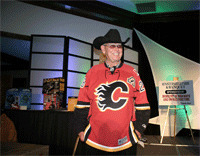 Roland’s memorial will be on June 29th in Calgary, Alberta. Please consult www.elrus.com for details on the time and place.